Over the holiday our family saw the film, Avatar. James Cameron’s blockbuster has grossed over $800 million worldwide, so he doesn’t need my promotion. But it is a remarkable film. It is set 150 years into the future. Humans (specifically, Americans) have landed on another planet, Pandora. We have a military outpost there and there is a desire for a valuable mineral on this planet, some kind of energy source in the ground. The problem is that on the surface is a forest and people. People of some kind. They are called the Navi and they are nine feet tall and blue with tails. They are like hunter-gatherer forest people with bows and arrows. The forest is lush and beautiful. The Earthlings are there to secure the minerals. The military is in service to the corporation who wants this valuable commodity. They will take it either by force or negotiation. Also there is a scientific group to study the Navi and their ecosystem. They have been able through technology to take the DNA from the Navi and create Navi bodies. Then through this machine a human can be the brain for the Navi body. These bodies are called avatars. If you play a game on the internet or enter a discussion group you select an avatar, some kind of image, to represent you. In this case the avatar is a real being. This way the scientists can interact with the Navi. The main character through his avatar is to learn about the Navi. The plan is to get them to move so the mineral can be mined or failing that, to find their weakness so they can be forced out. The conflict within the story is that this main character comes to develop a sense of compassion and identity with the Navi. Will he do his duty to his Earthlings or will he discover a new purpose and a new duty? I haven’t given anything away. You can get that from watching the previews. The reason I take up sermon time for this film is to point out one of its symbols. The word avatar comes from Hinduism. It refers to a deity being manifest in human form. In the Bhagavad Gita, what we are going to be reading in 2010, Krishna is the avatar of Vishnu. In human form, Krishna has the consciousness of God. In the Gospel of John, Jesus is similar. He is the avatar of divine wisdom. The avatar in the Bhagavad Gita is Krishna and he comes to Arjuna the warrior as a blue man. The iconography featuring Krishna has him as a human and his color is blue. 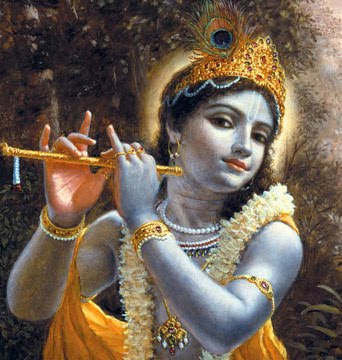 Whether a child or an adult when Krishna is depicted in human form he is blue. Why are the Navi, the good guys in the film, blue? What does it mean for the Earthling, the film’s hero, to become a blue Navi or a blue man? James Cameron’s film is a sermon. It is an invitation to us to become the blue man or the blue woman in our time. It is set in the future but it is about us. The blue man is an archetype. Not only is Krishna blue, but Shiva has a blue throat. Shiva earned his blue throat by drinking up the poison from the water. Doing so saved humanity while it turned his throat blue. Matthew Fox in his book, The Hidden Spirituality of Men: Ten Metaphors to Awaken the Sacred Masculine includes the Blue Man as one of the ten metaphors. 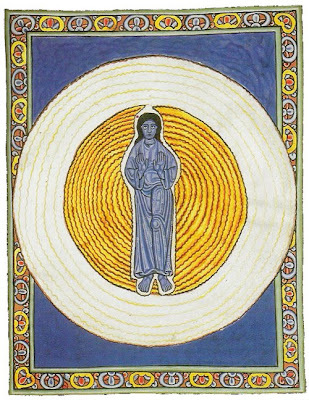 Fox begins this chapter on the Blue Man by recounting visions of two mystics, Swami Muktananda and Hildegaard of Bingen. 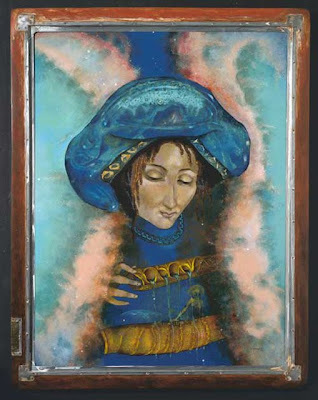 In her painting of the Blue Christ, his arms are extending outward, which is the gesture for compassion, the heart of compassion put to work in our hands. Blue is the color of compassion, peace, and healing. I didn’t know this at the time, but I wanted my study painted blue. I am glad I did. I must have unconsciously intuited the blue of healing, peace, and compassion. Blue is the color of Earth. 80 percent of Earth is covered with water. 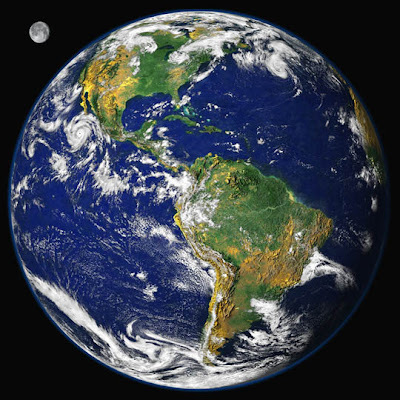 From space we a beautiful blue marble. A pale blue dot. We look up and see the sky blue. Blue is the color of Earth and Sky. Blue precedes the green. Mary, the mother of Christ, a figure of compassion and courage, is depicted in artwork with a blue headcovering. In Hinduism, persons with a depth a character and the capacity to defeat evil are blue-skinned. The creator has given the maximum of blue to nature (ie. the sky, oceans, rivers, and lakes) the deity who has the qualities of bravery and determination the ability to deal with difficult situations of stable mind and depth of character is represented as blue colored. Lord Krishna spent his life protecting humanity and destroying evil, hence he is colored blue. I don’t know. Another website said he was blue because he ate too many sweets. I like the first explanation better. If you see the movie Avatar, think of the Blue Person. What it means to become the Blue Person, the compassion, creativity, courage, and connection with all things including consciousness. All of that is in the film. James Cameron did his homework in that respect. Of course she does! Of course! This is about Divine play. This is about delight and play. Wisdom is more than intellect. It is more than a collection of numbers, dates, and formulas. It is more than cleverness and technology. It is artistry. It is playfulness. It tastes good. This Divine, playful, powerful, compassionate, Wisdom, the Wisdom Woman, Sophia is incarnated in Jesus! The historical person of Jesus was a sage, an artist, a teller of parables and stories. The tradition picked up on that and made him not only a teacher of wisdom but the embodiment of Wisdom as well. Jesus and Krishna both symbolize the incarnation of wisdom, creativity, and compassionate action on behalf of Earth and its people. They represent the Blue Person. We need more than ever to discover the Blue Person within each of us. In James Cameron’s film, Avatar, the Earthlings are smart and clever. They have incredible technology. The weapons are impressive. Traveling to another planet takes some creativity. But they aren’t very wise. They don’t understand the value of a tree and the ecosystems that connect trees with all Life dependent upon it and each other. Our hero at one point in the movie, says of the Earthlings. Cameron’s film is not about the future. Nor is it about some place else. It is about the present in this place. It is a film of warning. It is also an invitation to become wise as well as clever. To become compassionate as well as creative. I am hoping his film speaks to those who see it, inspiring in them reflection about our place on Earth at this time. I don't begrudge James Cameron grossing 800 million if his film helps change our consciousness. More than ever we need the wisdom and compassion of the Blue Man and the Blue Woman. We need the Krishna Consciousness and the Christ Consciousness and the Sophia Consciousness to be incarnate in each of us. We do exist for a purpose—to be the compassionate hands, feet, eyes, and ears of Earth itself. One of the ways we might access our own creativity, the creativity of the universe is to take the time for meditation or reflection. Take the time to read, write, paint, draw, walk in nature, and to sit and be. More than all, love the universe. fall in love with life. When we do that we will not help but to discover our compassion and become artists, prophets and healers. Mike and I just about cheered at the end of this one, John. John, this is fabulous. I'm sending a link to my sister in Minneapolis, who recently saw the movie, and loved it. She will very much appreciate the additional insights into the symbolism of "blue." Talk about reclaiming myth for the 3rd millennium!